Do you have Leaning or Bowing Walls in your Home? Significantly bowed or split block walls should be evaluated by a foundation engineer. Be it concrete or block, we advise monitoring cracks for ongoing change. If the wall is moving, it is unstable and needs corrective action by a foundation repair expert. Many basement walls, masonry or concrete, fail over time or begin to bow. This problem is often caused by too much lateral pressure from the soil outside, but also can be a result of an inadequate original design. Poor drainage, uncontrolled water, poor waterproofing and over compaction of the soil can also cause your basement wall to bow or fail. Basement waterproofing or replacing your sump pump helps divert water away from your foundation but the leaky walls and wall cracks are clues to “water caused” foundation stabilization issues. You will need a complete basement system to protect your home or structure. Whatever the cause of your foundation settlement or bowed walls, our contractors can solve your problems with helical piers, resistance piers or wall anchors. If you see these signs when you are looking over your home, it is time to get assistance from Reliable Masonry and Waterproofing. If you notice bowing walls that need repair in your Virginia basement, we offer helical tiebacks as a possible solution. 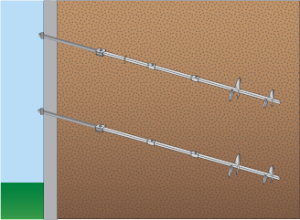 Helical tiebacks are designed to stabilize and strengthen walls that are bowed in or leaning from the pressure that has built up outside foundation walls. These tiebacks actually will pull the wall back and provide support for a long time to come. We use only the very best products for our foundation repairs from Earth Contact Products. ECP is the proven leader in the foundation repair industry, and we use their products in all our foundation repair work in the Virginia area. Helical tiebacks could be the solution to your bowing wall repair or leaning wall repair problems in your Virginia home or business. Bowing wall repairs should not be taken lightly. If left untreated, bowing or leaning walls could eventually lead to foundation failure. To find out if helical tiebacks are the right solution for your home, call the foundation repair team at Reliable Masonry and Waterproofing to inspect your foundation. We will provide you with an estimate and a solution that fits your specific needs. It is always recommended that you contact an engineer before having foundation repair work done on your home. Contact Reliable Waterproofing and Masonry for more information on their foundation services today!